The Atoll 11′ Inflatable Stand up Paddle Board is built to be extremely rigid and completely ready for everything you plan to paddle. It has the ability to provide an extremely rigid surface that is quite similar to the hard boards and the iSUP is softer which means greater comfort for the feet. Plus, its ability to pack down to a small size means it is very convenient to travel with whether this is by road or air. Extremely rigid – this iSUP is built to be extremely rigid with its 6 inch thickness that gives the type of stable platform underfoot similar to the traditional hard boards. Plus, its spacious surface is 32 inches in width by 11 feet in length and easily accepts up to 250 lbs in weight. Highly durable – the stiff and sturdy design of the Atoll 11′ SUP helps to create a solid platform with multi-layers on the top and bottom of the board. It has 14 D-rings on the top deck to simplify the process of tie down the board essentials. Portable – this iSUP is built to fit in a medium-size duffle bag for greater ease in foot travel and prefect for traveling the short distance until the preferred body of water is reached. 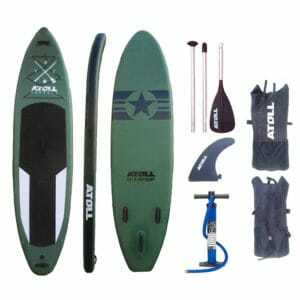 Package deal – the Atoll 11′ Inflatable Stand up Paddle Board is water-ready and is packaged with a high-pressure hand pump, travel backpack, bungee tie system, 3-piece paddle with nylon blade and removable fin. 2-year warranty – this board has a 2-year manufacturer’s warranty that relates to any material or workmanship defect. If you really want to find out want other SUP fans are saying about the Atoll 11′ Inflatable Stand up Paddle Board, why not take a look at the following pros and cons that have been sourced from real customer feedback. The Atoll 11′ Inflatable Stand up Paddle Board has a high 5.0 out of 5 rating on the Amazon marketplace to provide the complete package to get water-ready without delay. With its 250 lbs weight limit, super high-quality construction, and quick inflate/deflate design, this SUP gives a smooth and stable performance while also giving the option to convert into a kayak by using the included kayak paddle and seat.